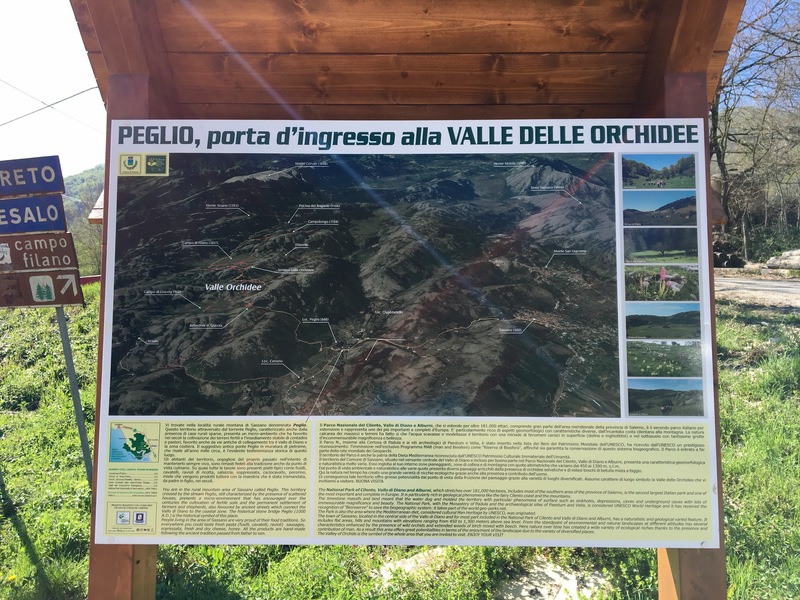 If you’re looking for a unique and beautiful escape not far from Naples, try the Orchid Trail in the Vallo di Diano in the Cilento National Park. Most of the year, the gentle hills of the Vallo di Diano are a quiet wilderness above the tiny, traditional village of Sassano. But the grassy slopes hide a glorious secret; just below the surface lie hundreds of species of Orchids – over 180 to be precise. In Spring (mid April – late June), they burst into life, enticing orchid lovers from all over the world to see the colourful display. 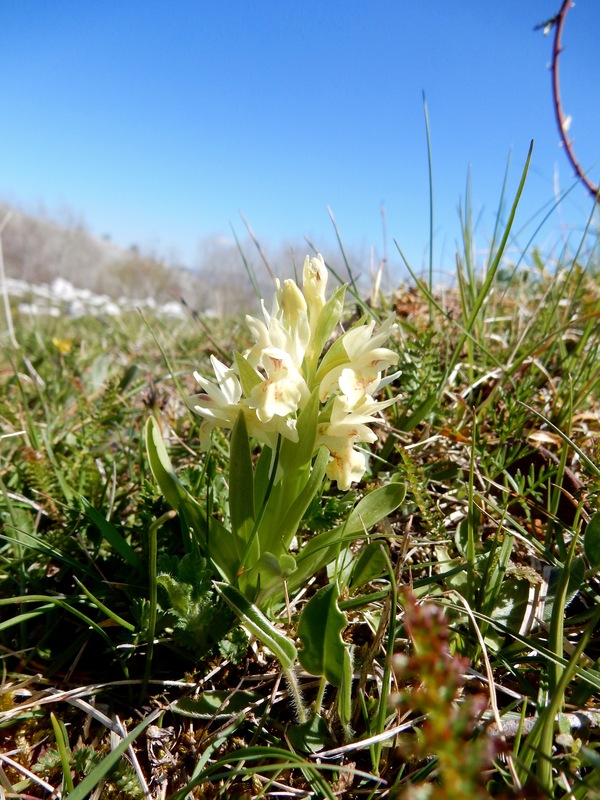 No wonder; this 47km zone has it’s own microclimate and hosts two thirds of all 319 orchid species found in the whole of Europe. 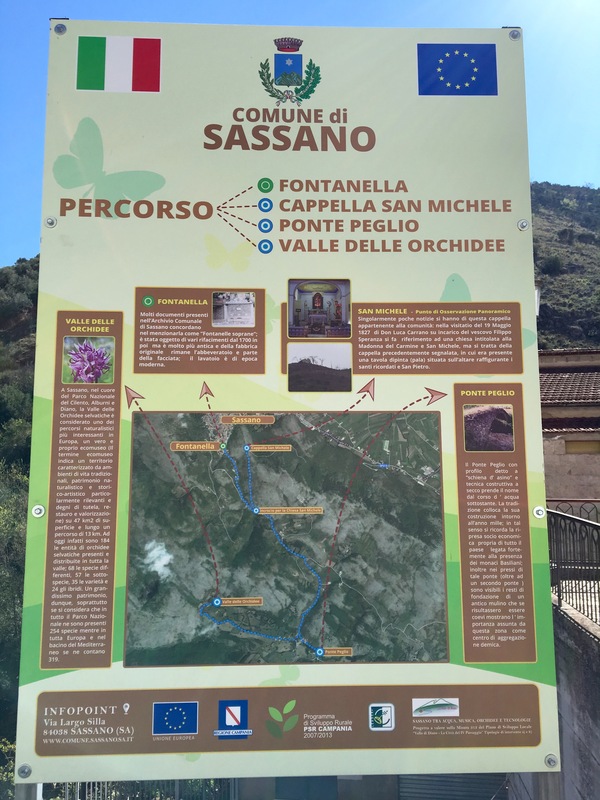 To celebrate, the pretty medieval village of Sassano holds an Orchid festival throughout May with guided walks, food tastings and cultural events. It’s only a 2.5-3 hour drive from Naples and definitely worth a long day trip or night away. It’s a quiet, ancient village with one tiny shop (in someone’s house) a bar, a fruit and veg seller, a couple of churches and a beautiful font and a wash house. If you want to slow down and experience authentic, rustic village life in the hills of Campania then this is a great place to visit – but don’t expect tourist facilities or lots of restaurants and buzz (which is why it’s so lovely)! I was lucky enough to stop here for our first night in our new van at the end of April (en route to Sicily). We arrived in the dark, negotiated Sassano’s narrow streets and headed out to the mountains to park and sleep. When we woke, we were surrounded by a silent valley with buzzards circling the deep blue sky above and not a soul to be seen. All around were undulating, grassy hills strewn with white limestone rocks. In sheltered hollows there were groves of beech and birch trees which were filled with wild flowers. After breakfast we drove to the top of the hill and enjoyed panoramic mountain views across the whole Cilento park, including to Campania’s highest point, Monte Cervati (1899m) which has a dusting of snow year round (you can walk up to the Sanctuary of ‘Madonna della Neve’ dedicated to Our Lady of the Snow). 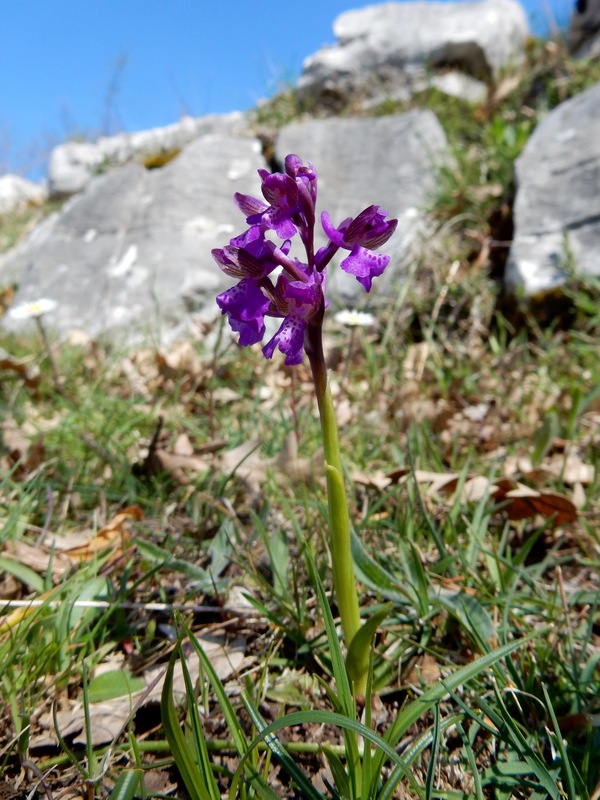 The official ‘Orchid Trail’ is a 13km route which ascends from 500m to 1175m and takes in 5 orchid observation stations. It begins in Sassano at the fountain with three stone masks and takes you along a small road (past the turn to the San Michael church) to the medieval Ponte Peglio (a 1000 year old bridge) in the village of Peglio. From here you go straight ahead, up a long winding hill to ‘Belvedere di Gravola’ (a wide parking area with map boards and great views). 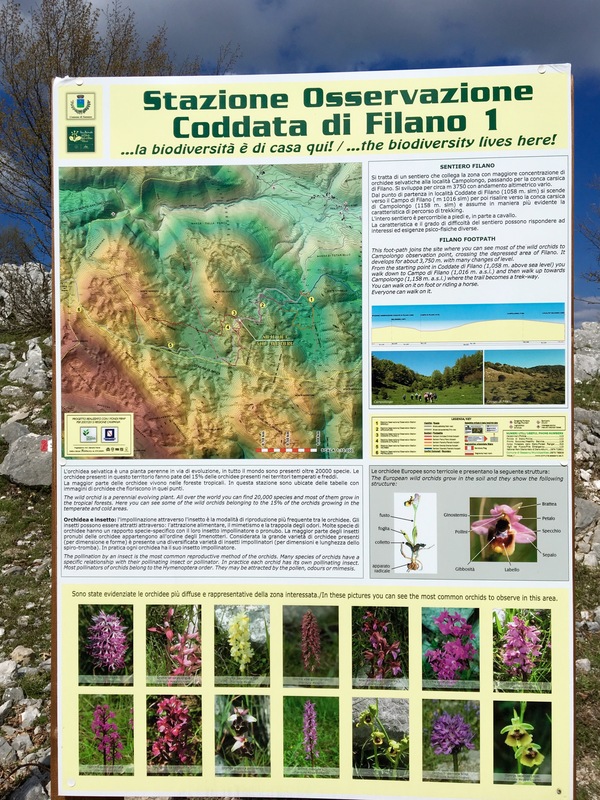 The trail is well marked, with red and white stripes on the stones and it will lead you through the various orchid stations (Campo di Gravola, Affunnaturo, Coddate di Filano, Valtasso and Pietralieddo) to the area ‘Campi di Filano’. After this you wind upwards again in order to reach the last stop ‘Piscina del Brigante’. 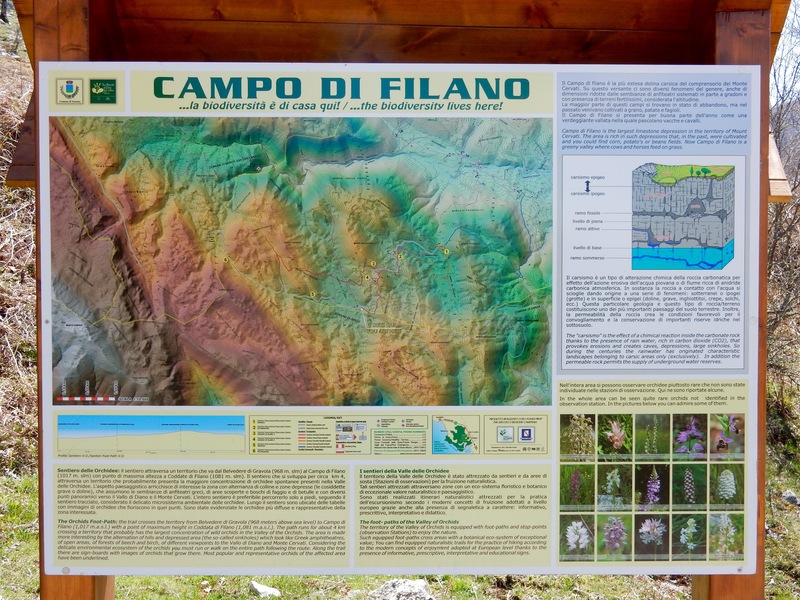 Campo di Filano is a glorious spot where the mountains curve into a huge natural basin (peppered with karst sink holes) and a large herd of wild horses congregate. I couldn’t have dreamed up a more lovely spot for our first picnic lunch by the van. The air was full of neighs and whinnies from the horses and we lay in the sun watching mares lead their foals to get water from the sheds by the road. It was so peaceful and isolated that we rigged up the solar shower off the back door, took our chances that a farmer wouldn’t arrive and had a ‘life affirming’ outdoor scrub! Unless you’re feeling energetic and want to do a full day of walking, I’d skip the first section from Sassano and drive straight up to Belvedere di Gravola. You can park here and just do the route to Campo di Filano (you may also want to miss the final bit up to Piscina del Brigante unless you have lots of time). This middle part is off road, but remains near and often crosses the road and it’s where you’ll see the majority of the orchids. At Campo di Filano, you can simply turn around and stroll back along the road to your car. Along the route there are posts with pictures and information about each species in Italian (although a few are now missing). 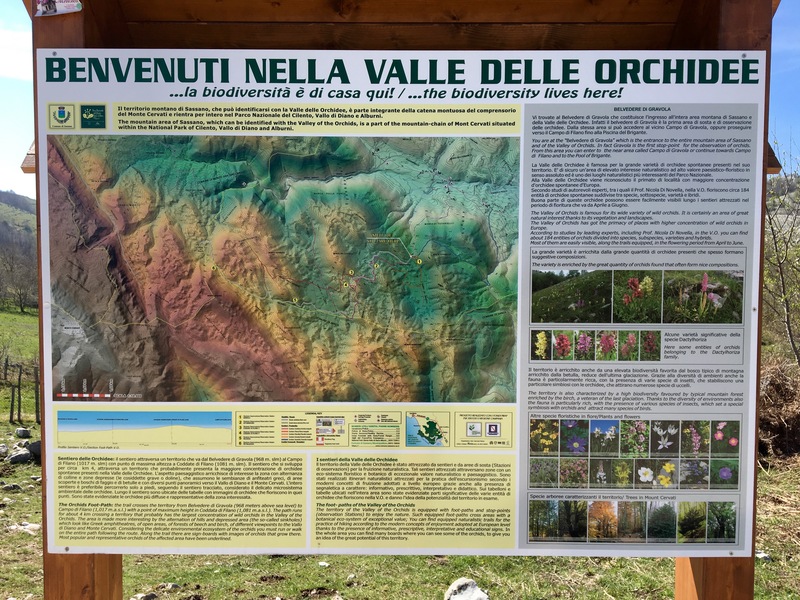 Re directions – I’d recommend taking a photo of the map boards when you start at Campi di Gravola and of any other map boards you see. I also used the ViewRanger app on street map setting which will tell you where you are and roughly help you follow the trail (it doesn’t have the exact trail but most of the footpaths so you can always link bits up if you need). Don’t worry if you loose the red and white markers occasionally – I did and ambled along all sorts of paths – just keep the road close by and you can’t go too far wrong! ***I’m sure I don’t really need to say but some of the orchids are very rare and you are prohibited from stepping on them or collecting flowers. Dogs would also need to be on a lead and tightly controlled (there are many other trails in the area which would be great for dogs though! ).